Recent disasters, namely the Lacrosse and Grenfell tower fires, have made fire safety a top concern for the Australian design and construction industry. Causing significant loss of life and millions of dollars in property damage, these tower fires brought about increased regulation and government audits Australia-wide, encouraging greater awareness of the fire safety risks associated with using non-compliant construction materials and products. In Australia, regulators have been given broader powers to identify unsafe building materials and builders knowingly using unsafe, non-compliant building materials face punitive fines. Against this backdrop, industry professionals are seeking reliable, versatile and high- performing cladding solutions that comply with the fire performance and testing requirements set out in the National Construction Code (NCC) and the relevant Australian Standards. While the Lacrosse and Grenfell tower fires were attributed to highly flammable aluminium composite (ACP) cladding, designers and specifiers should note that the primary cause of these fires was the highly flammable polyethylene core often found in cheaper composite panel solutions rather than aluminium itself. In fact, solid aluminium is a safe, non-combustible cladding alternative that has good thermal conductivity and does not release smoke or spark when exposed to fire. Solid, powder-coated aluminium cladding, such as DECO’s DecoClad aluminium cladding and facades, is a versatile external cladding solution that delivers superior fire resistance, structural performance and durability. Solid, powder-coated aluminium cladding contains no combustible materials or core, making it a much safer cladding option for buildingsdissipates heat and will melt rather than burn when exposed to fire, preventing the spread of flames. Unlike a wet paint finish, which can also pose a fire hazard, powder coatings will only char, preventing the rapid spread of flames across the cladding surface. Made in Australia, DecoClad is an aluminium exterior cladding and façade solution that combines aluminium’s proven strength and durability with DECO’s Super Durable™ powder coatings, such as DecoWood. Ideal for a myriad of residential and commercial applications, DecoClad is a versatile cladding solution that can be installed horizontally for the traditional weatherboard look, gable ends and facadefaçadess, or vertically as a modern architectural feature. Other applications include wall linings, ceilings, porticos and soffits. Furthermore, the Super Durable™ finish on DecoClad is marine grade and will not corrode when usedis suitable for use in beachfront applications. Designers and specifiers can choose DecoClad aluminium cladding and rest assured that it complies with the relevant Australian fire performance requirements and building standards. DecoClad has been independently tested and certified as compliant with Volume 1, Clause C.1.12 9 of the NCC (regarding the combustibility of building materials) and the testing regime specified in Australian Standards, AS/NZS 1530.3-1999 and AS 1530.1-1994, which set out the methods for fire testing on building materials, components and structures. DecoClad also meets the requirements of AS/NZS 3837-1998, which covers the method of testing for heat and smoke release rates for building materials and products. Available in five unique designs, including Narrowline, Shadowline, V-Groove, Weatherboard and Croatia Board systems and profiles, 30 DecoWood finishes and a wide range of plain colours, DecoClad offers maximum design flexibility. DecoClad is supplied in 6.5m lengths, which are lightweight and easy-to-install easy to install, reducing labour and resource costs during installation. Unlike other cladding materials such as timber, this product does not require sanding, painting or staining, reducing maintenance costs and energy consumption over the product lifecycle. Fully owned and operated in Australia, DECO has been the leading manufacturer of finished aluminium products since 2004. DECO offers high quality, durable finishes alongside an ever-expanding range of architectural products. 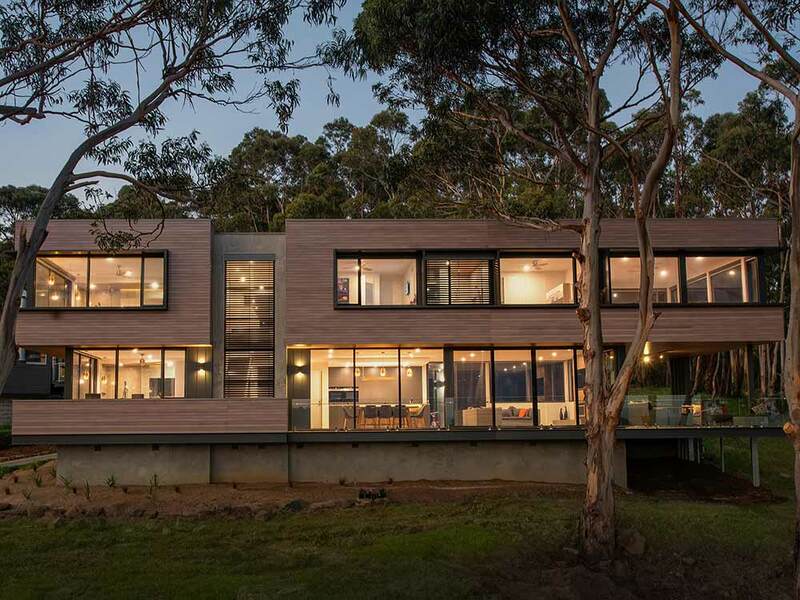 With their innovative finishing technology, high standards of customer service and commitment to creating high quality, sustainable alternatives to timber, wood composites and PVC building products, DECO meets the evolving needs of the Australian building industry and the wider community. For more information and to learn more about DecoClad, visit the DECO website.